WASHINGTON, DC (Herald de Paris) -- Graceful, lean and fit as a racehorse with a strong handshake that puts many men to shame, Dr. Jill Biden took the stage at the White House on Wednesday, as part of her Joining Forces initiative. Dressed in a sleek, black, brass-buttoned, cropped jacket, Dr. Biden, a woman who herself, has suffered tremendous loss, stood resolute in her commitment and conviction to Educate the educators of the children of military families both here and overseas. The event was held in collaboration with the Military Child Education Coalition (MCEC) and the University of Southern California (USC). Dr. Biden launched the Joining Forces Initiative with First Lady Michelle Obama with the mission to give all Americans the opportunity to step up and show their support for those who serve in the United States military. Dr. Biden said, "I have been privileged to shine a light on the thousands of families -- and children -- who have taken on these challenging roles without complaint. They are my everyday heroes who often want no acknowledgment. One of the best parts of my role as Second Lady is spending time with so many veterans and military families. As I travel to bases across the country -- and the world -- I am always inspired by their strength and resilience." As I listened to Dr. Biden talk about her work and how she met, "Teachers in Illinois who are using writing and art therapy to help National Guard kids with deployed parents express their fear and anxiety." and the fact she met a teacher in Georgia, "Who arranges parent-teacher conferences by Skype so that a parent deployed in Afghanistan can participate," something else struck me. It was the American spirit. Here we had a woman, a high achiever yes, but in basic terms, an ordinary woman, who did not need to be doing any of this. A woman could easily put her feet up and simply be Second Lady. It made me think of First Ladies, Second Ladies, indeed, the spouses, female or male, of President's, Prime Ministers and leaders around the world. It made one think about some of the things that made America unique. America is a country that has a strong sense of giving back, where individuals rise up and stand up, to make the world better for others, even when they don't need too, or indeed, cannot afford to. More importantly, it is a country, where it is allowed and acceptable to do so. It happens in all strata's of society in America. Currently everyday American's are battling in their individual states to raise the minimum wage from approximately $8.25 per hour to a livable $15 per hour. A minimum wage that has been raised many times in the past few years in many countries including Australia, New Zealand and Canada. "Standing up," and taking positive action, is an intrinsic part of the American spirit, it is part of what attracts others to America, it is part of what has made America build the country it has, with some extraordinary technological, scientific, cultural and artistic achievements and also lead the world in many areas. It has not been without fault at times of course, slavery a prime example, but America, considering it's size, has been relatively quick to rectify its wrongs, again with the will of the people and the will of individuals - be it Vietnam, slavery or raising the minimum wage. In the western world, the British royalty aside, there are few spouses of any leader who go out of their way to identify and create unique initiatives, and build significant resources to create betterment. It gets right to the core of the American people. These women, Dr. Jill Biden, the First Lady Michelle Obama, and those who have come before, be it Laura Bush, Hillary Clinton, or Nancy Reagan, don't do it because it is solely expected, they do it as it is who they are, it is who they are as Americans. Although admittedly, Ms. Clinton's reasons are more politically minded but she made great strides for women and equality. Either way, it is the humanity of being an American. That is one thing that one hopes never gets lost in this new corporate world. Dr. Biden continued, "One of the students I met that day told me that her family moved to Fort Riley in the middle of the school year, and so she missed the auditions for the school play. But, because her teachers knew how difficult transitions and starting over can be, they gave her the opportunity to be part of it. That doesn't always happen for military students." Dr. Biden is right, and one can only imagine the impact that had on this child's life -be it school play, sports fields, attention can be made and must be made to the individual child - whether its military family, or indeed otherwise. Dr. Biden said that Fort Riley, which has 8000 military children, "Represents what I hope all schools could do for our military families: a community-wide effort -- one in which Kansas State University has invested heavily in educating their teachers -- to better serve the needs of their military students." 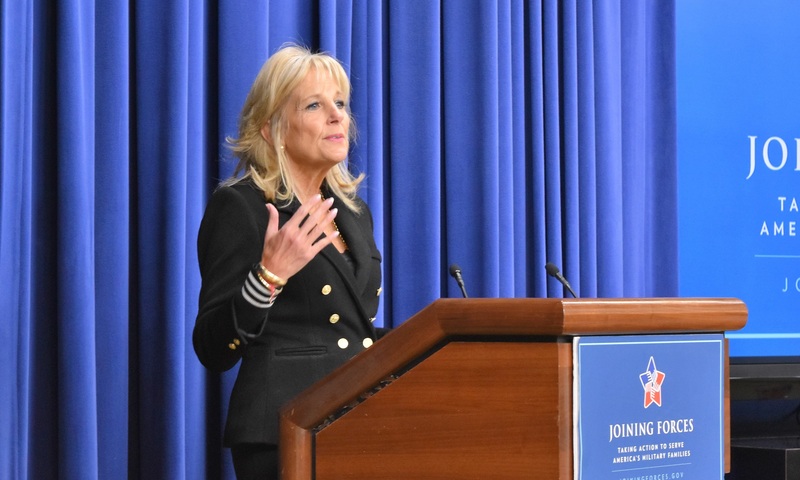 Dr. Biden pointed out that, "Not every public school is in a military community where nearly all of the student population is military-connected. Not every teacher, faculty member and administrator lives the same life as military families do, day in and day out. And, in some cases, not all public schools and teachers have been afforded the opportunity and resources they need to truly understand how to recognize and support the needs of these unique and inspiring students." The tenacious Dr. Biden has deftly targeted a matter that has been largely overlooked. She along, with Michelle Obama, is in the process of making a difference and creating a movement in the United States and around the world, to be aware of what children of military families deal with in terms of constant moves and transitions. In closing, Dr. Biden stressed how the smallest act of kindness can make more of a difference in the lives of so many military students and their families than anyone might realize. And that is exactly what is needed around the world-for all people. Loving kindness. As I said in my award winning film Buddha Wild, http://www.buddhawildfilm.com it is not just enough to say have, "Loving kindness." You have to do it. You must act. You must do it.